Three International Space Station residents parachuted to a safe landing Wednesday in a picturesque morning scenery in the steppe of Kazakhstan where their Soyuz TMA-20M spacecraft touched down after circling the Earth 2,752 times. 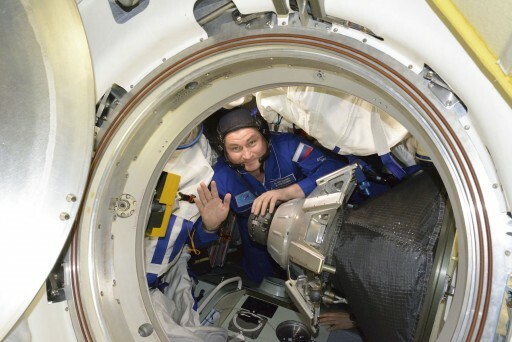 Still strapped into the confined space of the Soyuz Entry Module, crewmates Alexey Ovchinin, Oleg Skripochka and Jeff Williams enjoyed a breath of fresh air for the first time in 172 days when recovery crews opened up the hatch to the spacecraft. 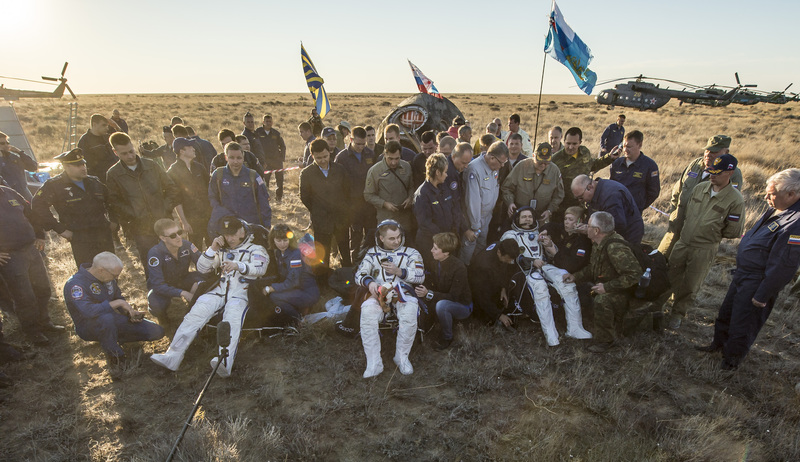 The Russian-American crew was greeted by a beautiful late summer morning with clear skies and warm temperatures in south central Kazakhstan where the crew’s five-and-a-half month journey to space found its successful conclusion in a bulls-eye landing aboard the Russian workhorse spacecraft. The Soyuz trio boarded their spacecraft at 18:42 UTC on Tuesday when they sealed themselves off from the Space Station and the three remaining crew members to enter the multi-hour setup for their return. Soyuz TMA-20M – the last in the TMA-M series to fly – made an on-time undocking at 21:51 UTC and fired its engines twice to begin opening of a sufficient gap to ISS for the large deorbit maneuver. Soyuz circled the Earth one and a half times before firing its braking rocket at 0:21 UTC, slowing down just enough to drop itself out of orbit and head toward a blazing re-entry. Separating from the disposable Entry & Service Modules, the small Entry Module with the crew inside emerged from orbital night for the ride of a lifetime. 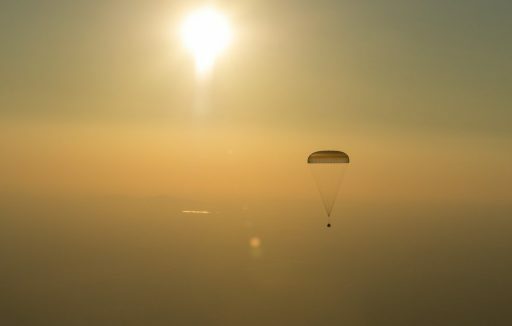 Pulling up to five Gs during the speedy return, Soyuz deployed its parachutes and entered a calm descent over the Kazakh steppe. Soyuz touched down on target and on time at 1:13 UTC, cushioning its impact by firing Soft Landing Engines that kicked up a cloud of dust due to persistently dry conditions in the Kazakh steppe. 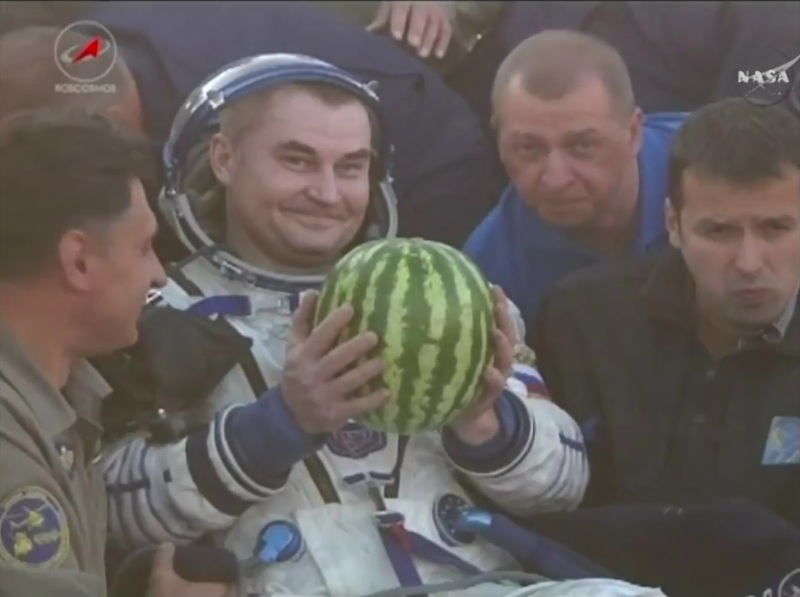 All three crewmen appeared to be in very good physical condition after their return, quick with a few jokes and seemingly eager to share how they experienced their turbulent ride to Earth. The crew’s journey started back on March 18 with a nighttime liftoff from the Baikonur Cosmodrome, the on-ramp to space for crews traveling to the Space Station. A nine-minute ride to orbit atop their Soyuz FG rocket set the crew up for a high-speed chase of ISS, completing a fully automated docking six hours after liftoff to join the Expedition 47 crew aboard the Station. The combined crew hit the ground running, tackling a busy schedule of dozens of experiments active at any given time in the various laboratory modules of ISS taking advantage of the unique environment of Low Earth Orbit. Acting as test subjects for many experiments, the crew members regularly participated in sample collection and different medical observations as well as tests of their vision and cognitive abilities. In April, the Dragon SpX-8 spacecraft arrived, marking Dragon’s return to flight after nearly a year of absence and also marking the delivery of the Bigelow Expandable Activity Module – the first expandable module to be attached to the Space Station for a two-year test run of the technology in an operational environment. 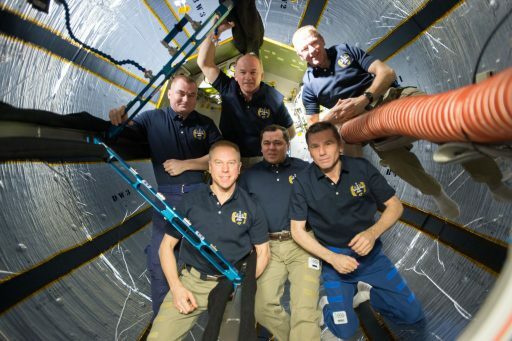 BEAM was installed in mid-April and inflated at the end of May, allowing the crew to check out its interior, showing the brand new and innovative module with a selfie of all crew members inside BEAM. The Cygnus OA-6 spacecraft departed ISS in mid June after the longest stay to date by a commercial cargo craft. Its departure was followed only a few days later by the return of Soyuz TMA-19M and crew members Malenchenko, Peake and Kopra ahead of an extended period of three-crew operations on ISS during which Williams, Ovchinin and Skripochka were all hands on deck to manage regular ISS maintenance tasks while continuing science operations. 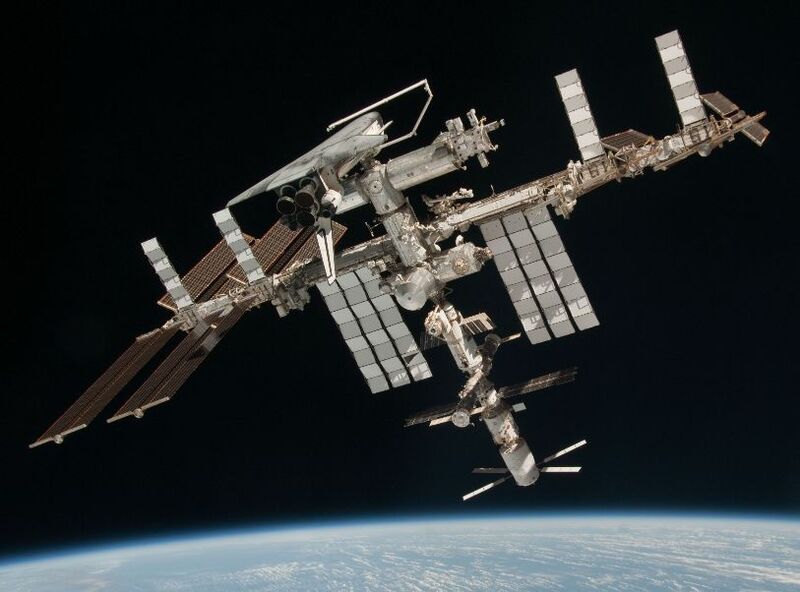 Progress MS, the very first in the MS series to fly to ISS featuring a number of systems improvements, completed an undocking-re-docking exercise under remote control in late June, also eliminating concerns for the first crewed MS vehicle. Soyuz MS-01, the first in the improved line of Soyuz spacecraft, completed a two-day rendezvous with ISS in early July, bringing Commander Anatoli Ivanishin and Flight Engineers Takuya Onishi and Kate Rubins to ISS. Less than a week later, Progress MS-02 pulled into port at ISS to deliver cargo for the Russian segment of ISS while the SpaceX Dragon SpX-9 craft was captured for a stay on the U.S. Segment. Towards the end of his fourth flight into space, Jeff Williams passed Scott Kelly in the total career time spent in space, setting a new U.S. Spaceflight Record. Williams flew to ISS for the first time in 2000 and is one of only a few Astronauts to see ISS in its infancy as well as its fully operational configuration as an out-of-this-world laboratory. 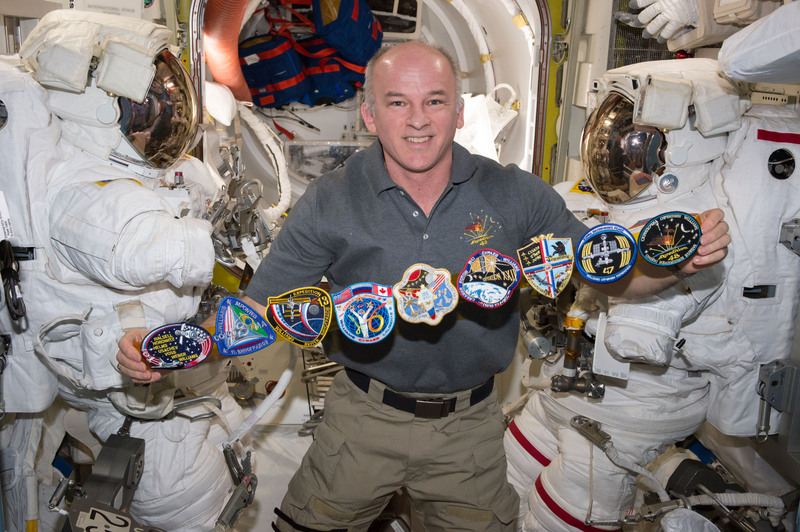 Williams added to his spacewalking record in two EVAs performed recently with Kate Rubins to install the first International Docking Adapter on ISS to establish an operational docking port for future commercial crew missions. 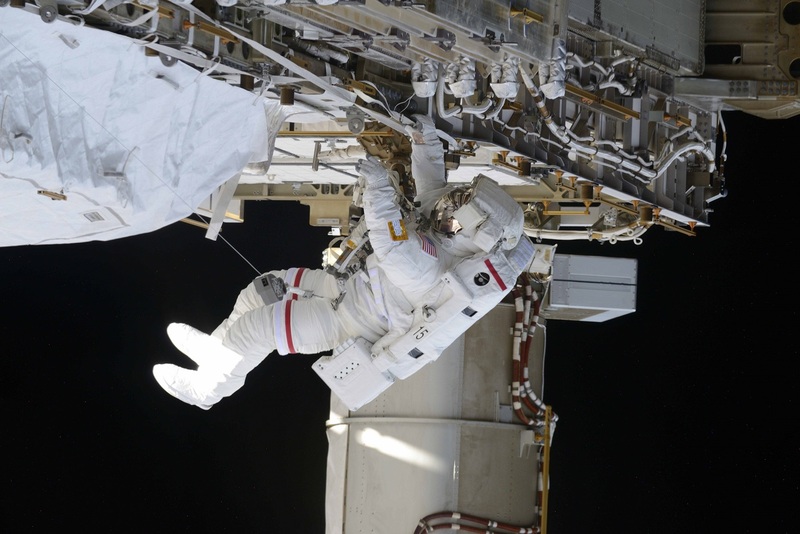 Their second EVA saw the retraction of a spare thermal radiator and the deployment of a pair of HD cameras on the Station’s truss to deliver high-resolution imagery for external surveys and Earth observations. Bidding farewell to their crewmates and their home in space, the Soyuz trio floated aboard their spacecraft and hatches on both sides were closed to begin a two-hour process of checking for leaks and readying their Soyuz for departure, also donning their Sokol Launch and Entry Suits – the crew’s last line of defence in case of a depressurization on the way down. Alexey Ovchinin, flanked to his left by veteran Cosmonaut Oleg Skripochka and his right by U.S. record holder Jeff Williams, sealed themselves off in the small Entry Module and commanded Soyuz to onboard power before enabling the automatic undocking sequence. 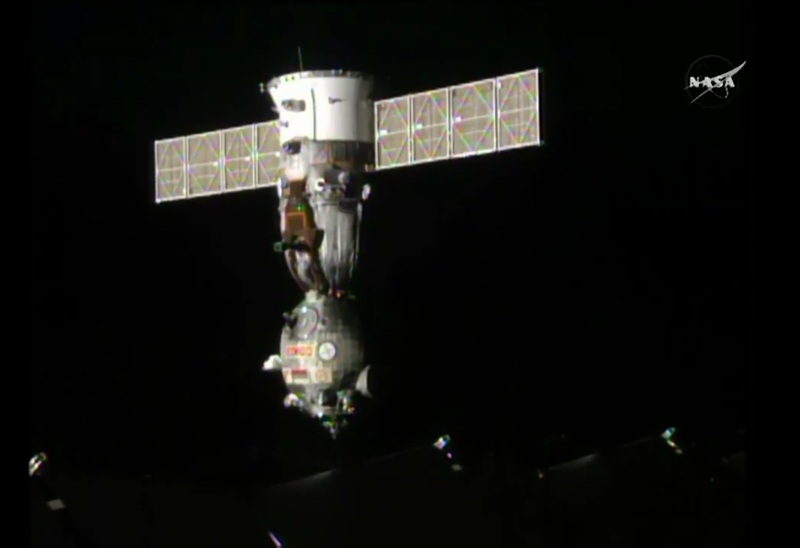 Hooks started driving open at 21:50 UTC and loaded springs pushed the spacecraft away 90 seconds later, marking the start of the crew’s homecoming. Soyuz drifted away from the orbital complex for three minutes ahead of firing its DPO thrusters, first for eight seconds to accelerate its departure and then for half a minute to be set on a course away from the Station. The crew then settled down inside the ‘cozy’ Entry Module for the next lap around the planet before beginning the multi-step process of preparing Soyuz for its fiery return to Earth. 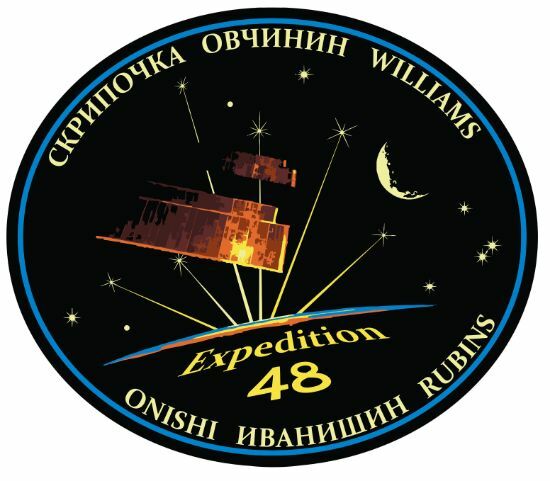 The Station’s newly installed HD cameras demonstrated their abilities during the undocking of Ovchinin, Skripochka and Williams, tracking their Soyuz for over half an hour. Having re-oriented to a tail-first attitude, Soyuz ignited its SKD main propulsion system at 0:21:25 UTC to hit the brakes and place the spacecraft onto a sub-orbital arc intersecting Earth’s atmosphere at a precisely calculated location. Firing for four minutes and 41 seconds, the 300-Kilogram force main engine slowed the seven-metric-ton spacecraft down by 128 meters per second which is just enough to drop it out of orbit. Free falling toward the atmosphere, Soyuz again accelerated to a speed of 7.6 Kilometers per second while the crew closed their helmets to be ready for the separation of the modules. A series of bangs shook the spacecraft when pyrotechnics fired in very close succession to separate the Entry Module from the Service and Orbital Modules that were headed for destruction at re-entry. 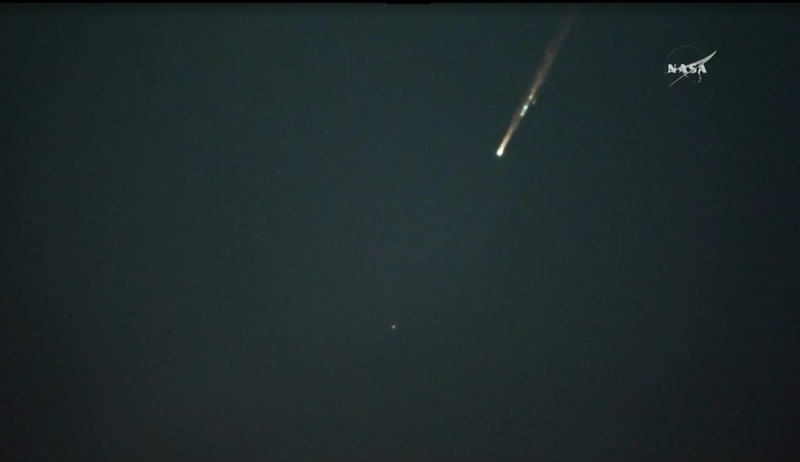 Module separation – confirmed by a ground station in Egypt – occurred 140 Kilometers over the Red Sea while Soyuz was still flying through darkness. With its heat shield facing forward, the 2.2 by 2.17-meter Entry Module emerged from orbital night just as it hit Earth’s atmosphere, descending through 100 Kilometers in altitude over northern Iraq. Slamming into the dense layers of the atmosphere, Soyuz relied on its ablative heat shield to slowly burn away and create a boundary between the extremely hot layer of compressed air in front of the capsule traveling at hypersonic speed. Temperatures on the heat shield reached 1,600°C and the windows started glowing bright yellow while the Soyuz was immersed in plasma, creating a lengthy drop out in communications between the crew and Mission Control. Rapidly decelerating, Soyuz and its crew pulled a maximum of 4.2Gs and the spacecraft actively modified its trajectory to arrive at a pre-determined parachute deployment position. Passing through 10.7 Kilometers, Soyuz blew its parachute cover and mortars ejected two Pilot Chutes that, upon inflation, pulled out the Drogue Chute – a sequence occurring while Soyuz traveled 0.7 times the speed of sound. For the crew, parachute deployment is one of the most violent events because Soyuz gyrates under the chute for about half a minute before its descent stabilizes. Clear skies at the landing site allowed the recovery team to track the incoming Soyuz for a large portion of the descent under its chute. 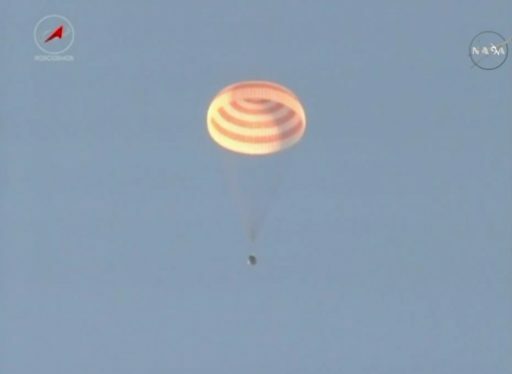 The Main Chute deployed around 7.5 Kilometers in altitude and Soyuz initiated its landing program – dropping the heat shield, venting its propellant tanks and equalizing the cabin pressure before lifting the three crew seats up for shock-absorbing purposes upon landing. Soyuz used its gamma-ray altimeter to judge when touchdown was imminent to blast the solid-fueled Soft Landing Engines in order to cushion its impact. Landing occurred at 1:13:58 UTC, 7:13 a.m. local time in the Kazakh steppe to cap a flight of 172 days and 3 hours. 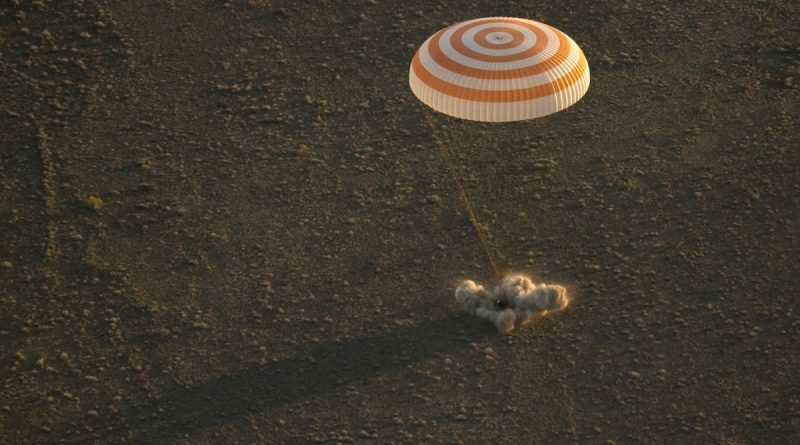 Ending their adventure with a noticeable landing, the crew remained in their seats while a 300-strong recovery team approached the landed Soyuz. 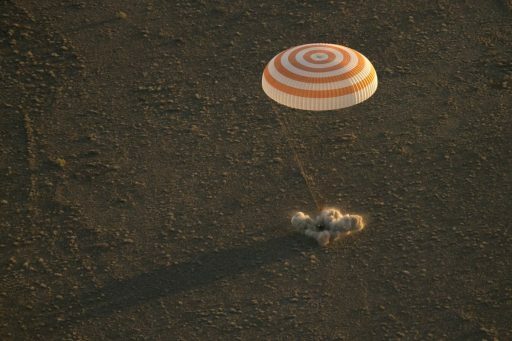 Ground-based vehicles began rushing toward the Soyuz while it was still descending under its parachute and helicopters entered a racetrack pattern to land in quick succession next to the vehicle. Recovery specialists were extremely quick in getting to the Soyuz and established voice communications with the crew before moving in to open the hatch of the spacecraft that had come to rest on its side. 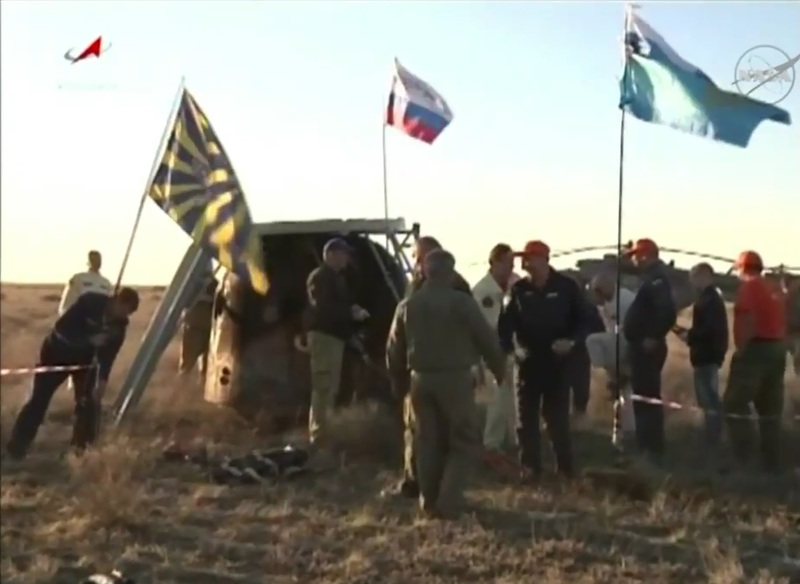 All three crew members were extracted from the capsule in good physical condition, appearing in good spirits as they were sat in reclining chairs next to their spacecraft and could enjoy fresh morning air for the first time in nearly half a year. Jeff Williams, now with four flights under his belt, has spent 534 days off the planet, ranking 14th on the all-time list with only Cosmonauts ahead of him. His career spans two decades and he can look back on missions aboard the Space Shuttle, ISS and the Russian Soyuz as well as five spacewalks totaling nearly 32 hours. Oleg Skripochka comes back from his second long-duration stay on the International Space Station, now with a new total of 331.5 days logged in space. Soyuz Commander Alexey Ovchinin logged 172 days in space on his first flight. 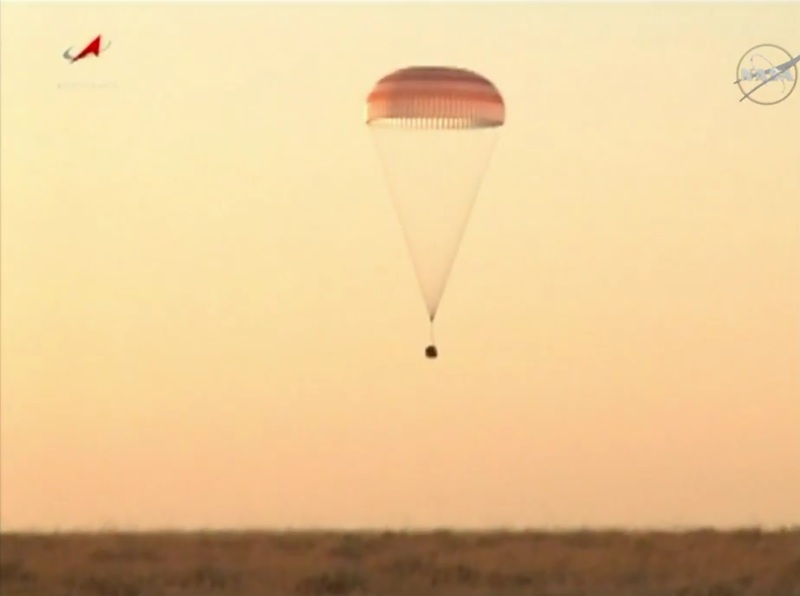 The three crew members will part ways after a welcoming ceremony in Karaganda, north east of the landing site. 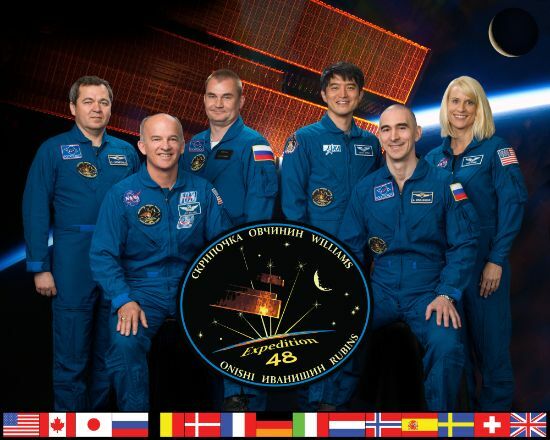 The two Cosmonauts will take a plane back to Moscow where they will under post-flight activities while Jeff Williams will have a longer trip, boarding a NASA plane to fly back to Houston, making several stops along the way before arriving at Ellington Field late on Wednesday. At the Baikonur Cosmodrome, preparations are already underway for the launch of the next Soyuz crew of commander Sergei Ryzhikov and Flight Engineers Andrei Borisenko and NASA’s Shane Kimbrough. With liftoff set for September 23, their mission will begin with a two-day rendezvous for testing of the new Soyuz MS systems before that variant too will be cleared for the much faster four-orbit rendezvous.